What Happens If I Don’t Pump My Septic Tank? Let me ask you this: What happens if you don’t change your engine oil in your vehicle? Chances are your vehicle won’t break down if you wait longer than the recommended time to change your oil, but waiting too long or never changing it will have negative effects on your engine. It’s the same with your septic system. The average recommended pumping frequency is between 3 and 5 years, depending on the tank size and number of occupants. A year or two longer won’t cause your system to fail immediately, but continued neglect will shorten its lifespan. As paper and waste enter the septic tank from your house, the solid matter will be held in the tank and break down into “sludge” over time, while the liquids continue on to the absorption area. Sludge is never meant to exit your septic tank, so it must be pumped out on a regular basis — you don’t want the sludge to accumulate to the point where it starts exiting the tank towards the absorption area. We get many calls from owners with the same story: “My septic system is 20 years old and I’ve never pumped the tank out.” We are careful to let them know that we can pump their tank now, but it may not solve the problem if damage has already been done (i.e., if sludge has entered the drainfield). 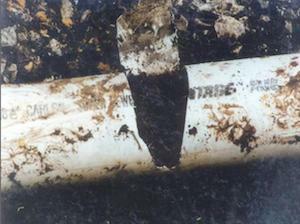 To give you an example, the picture at the top of this blog post is of a sludge-filled pipe from a septic system whose owner waited too long to pump their septic tank. Septic system regulations have changed drastically in the last 15 years, and often older systems with this kind of damage must be completely replaced. Perhaps if the septic system’s owner had had the tank pumped on a regular basis, they could have gotten many more years of life out of their system. Need a septic tank pumping? Van Delden specializes in septic tank cleaning — we pump out an average of 2,500 tanks per year. If you would like a free phone quote to pump your tank, give us a call or contact us online. We have the experience to pump out your tank the best way, the right way, every time. ← What is Septic System Failure?